"Riemann" redirects here. For other people with the surname, see Riemann (surname). For other topics named after Bernhard Riemann, see List of topics named after Bernhard Riemann. Georg Friedrich Bernhard Riemann (German: [ˈɡeːɔɐ̯k ˈfʁiːdʁɪç ˈbɛɐ̯nhaɐ̯t ˈʁiːman, geˈɔɐ̯k -] ( listen); 17 September 1826 – 20 July 1866) was a German mathematician who made contributions to analysis, number theory, and differential geometry. In the field of real analysis, he is mostly known for the first rigorous formulation of the integral, the Riemann integral, and his work on Fourier series. His contributions to complex analysis include most notably the introduction of Riemann surfaces, breaking new ground in a natural, geometric treatment of complex analysis. His famous 1859 paper on the prime-counting function, containing the original statement of the Riemann hypothesis, is regarded as one of the most influential papers in analytic number theory. Through his pioneering contributions to differential geometry, Riemann laid the foundations of the mathematics of general relativity. He is considered by many to be one of the greatest mathematicians of all time. Riemann was born on September 17, 1826 in Breselenz, a village near Dannenberg in the Kingdom of Hanover. His father, Friedrich Bernhard Riemann, was a poor Lutheran pastor in Breselenz who fought in the Napoleonic Wars. His mother, Charlotte Ebell, died before her children had reached adulthood. Riemann was the second of six children, shy and suffering from numerous nervous breakdowns. Riemann exhibited exceptional mathematical skills, such as calculation abilities, from an early age but suffered from timidity and a fear of speaking in public. During 1840, Riemann went to Hanover to live with his grandmother and attend lyceum (middle school). After the death of his grandmother in 1842, he attended high school at the Johanneum Lüneburg. In high school, Riemann studied the Bible intensively, but he was often distracted by mathematics. His teachers were amazed by his adept ability to perform complicated mathematical operations, in which he often outstripped his instructor's knowledge. In 1846, at the age of 19, he started studying philology and Christian theology in order to become a pastor and help with his family's finances. During the spring of 1846, his father, after gathering enough money, sent Riemann to the University of Göttingen, where he planned to study towards a degree in Theology. However, once there, he began studying mathematics under Carl Friedrich Gauss (specifically his lectures on the method of least squares). Gauss recommended that Riemann give up his theological work and enter the mathematical field; after getting his father's approval, Riemann transferred to the University of Berlin in 1847. During his time of study, Carl Gustav Jacob Jacobi, Peter Gustav Lejeune Dirichlet, Jakob Steiner, and Gotthold Eisenstein were teaching. He stayed in Berlin for two years and returned to Göttingen in 1849. Riemann held his first lectures in 1854, which founded the field of Riemannian geometry and thereby set the stage for Albert Einstein's general theory of relativity. In 1857, there was an attempt to promote Riemann to extraordinary professor status at the University of Göttingen. Although this attempt failed, it did result in Riemann finally being granted a regular salary. In 1859, following the death of Dirichlet (who held Gauss's chair at the University of Göttingen), he was promoted to head the mathematics department at the University of Göttingen. He was also the first to suggest using dimensions higher than merely three or four in order to describe physical reality. In 1862 he married Elise Koch and they had a daughter. Riemann's tombstone in Biganzolo in Piedmont, Italy. Riemann fled Göttingen when the armies of Hanover and Prussia clashed there in 1866. He died of tuberculosis during his third journey to Italy in Selasca (now a hamlet of Verbania on Lake Maggiore) where he was buried in the cemetery in Biganzolo (Verbania). Riemann was a dedicated Christian, the son of a Protestant minister, and saw his life as a mathematician as another way to serve God. During his life, he held closely to his Christian faith and considered it to be the most important aspect of his life. At the time of his death, he was reciting the Lord’s Prayer with his wife and died before they finished saying the prayer. Meanwhile, in Göttingen his housekeeper discarded some of the papers in his office, including much unpublished work. Riemann refused to publish incomplete work, and some deep insights may have been lost forever. For those who love God, all things must work together for the best. Riemann's published works opened up research areas combining analysis with geometry. These would subsequently become major parts of the theories of Riemannian geometry, algebraic geometry, and complex manifold theory. The theory of Riemann surfaces was elaborated by Felix Klein and particularly Adolf Hurwitz. This area of mathematics is part of the foundation of topology and is still being applied in novel ways to mathematical physics. In 1853, Gauss asked his student Riemann to prepare a Habilitationsschrift on the foundations of geometry. Over many months, Riemann developed his theory of higher dimensions and delivered his lecture at Göttingen in 1854 entitled "Ueber die Hypothesen welche der Geometrie zu Grunde liegen" ("On the hypotheses which underlie geometry"). It was only published twelve years later in 1868 by Dedekind, two years after his death. Its early reception appears to have been slow but it is now recognized as one of the most important works in geometry. The subject founded by this work is Riemannian geometry. Riemann found the correct way to extend into n dimensions the differential geometry of surfaces, which Gauss himself proved in his theorema egregium. The fundamental object is called the Riemann curvature tensor. For the surface case, this can be reduced to a number (scalar), positive, negative, or zero; the non-zero and constant cases being models of the known non-Euclidean geometries. Riemann's idea was to introduce a collection of numbers at every point in space (i.e., a tensor) which would describe how much it was bent or curved. Riemann found that in four spatial dimensions, one needs a collection of ten numbers at each point to describe the properties of a manifold, no matter how distorted it is. This is the famous construction central to his geometry, known now as a Riemannian metric. or to the interior of the unit circle. The generalization of the theorem to Riemann surfaces is the famous uniformization theorem, which was proved in the 19th century by Henri Poincaré and Felix Klein. Here, too, rigorous proofs were first given after the development of richer mathematical tools (in this case, topology). For the proof of the existence of functions on Riemann surfaces he used a minimality condition, which he called the Dirichlet principle. Karl Weierstrass found a gap in the proof: Riemann had not noticed that his working assumption (that the minimum existed) might not work; the function space might not be complete, and therefore the existence of a minimum was not guaranteed. Through the work of David Hilbert in the Calculus of Variations, the Dirichlet principle was finally established. Otherwise, Weierstrass was very impressed with Riemann, especially with his theory of abelian functions. When Riemann's work appeared, Weierstrass withdrew his paper from Crelle's Journal and did not publish it. They had a good understanding when Riemann visited him in Berlin in 1859. Weierstrass encouraged his student Hermann Amandus Schwarz to find alternatives to the Dirichlet principle in complex analysis, in which he was successful. An anecdote from Arnold Sommerfeld shows the difficulties which contemporary mathematicians had with Riemann's new ideas. In 1870, Weierstrass had taken Riemann's dissertation with him on a holiday to Rigi and complained that it was hard to understand. The physicist Hermann von Helmholtz assisted him in the work over night and returned with the comment that it was "natural" and "very understandable". , this is the Jacobian variety of the Riemann surface, an example of an abelian manifold. Many mathematicians such as Alfred Clebsch furthered Riemann's work on algebraic curves. These theories depended on the properties of a function defined on Riemann surfaces. For example, the Riemann–Roch theorem (Roch was a student of Riemann) says something about the number of linearly independent differentials (with known conditions on the zeros and poles) of a Riemann surface. According to Detlef Laugwitz, automorphic functions appeared for the first time in an essay about the Laplace equation on electrically charged cylinders. Riemann however used such functions for conformal maps (such as mapping topological triangles to the circle) in his 1859 lecture on hypergeometric functions or in his treatise on minimal surfaces. In the field of real analysis, he discovered the Riemann integral in his habilitation. Among other things, he showed that every piecewise continuous function is integrable. Similarly, the Stieltjes integral goes back to the Göttinger mathematician, and so they are named together the Riemann–Stieltjes integral. In his habilitation work on Fourier series, where he followed the work of his teacher Dirichlet, he showed that Riemann-integrable functions are "representable" by Fourier series. Dirichlet has shown this for continuous, piecewise-differentiable functions (thus with countably many non-differentiable points). Riemann gave an example of a Fourier series representing a continuous, almost nowhere-differentiable function, a case not covered by Dirichlet. He also proved the Riemann–Lebesgue lemma: if a function is representable by a Fourier series, then the Fourier coefficients go to zero for large n.
Riemann's essay was also the starting point for Georg Cantor's work with Fourier series, which was the impetus for set theory. He also worked with hypergeometric differential equations in 1857 using complex analytical methods and presented the solutions through the behavior of closed paths about singularities (described by the monodromy matrix). The proof of the existence of such differential equations by previously known monodromy matrices is one of the Hilbert problems. He made some famous contributions to modern analytic number theory. In a single short paper, the only one he published on the subject of number theory, he investigated the zeta function that now bears his name, establishing its importance for understanding the distribution of prime numbers. The Riemann hypothesis was one of a series of conjectures he made about the function's properties. Riemann knew of Pafnuty Chebyshev's work on the Prime Number Theorem. He had visited Dirichlet in 1852. 1868 On the hypotheses which lie at the foundation of geometry, translated by W.K.Clifford, Nature 8 1873 183 – reprinted in Clifford's Collected Mathematical Papers, London 1882 (MacMillan); New York 1968 (Chelsea) http://www.emis.de/classics/Riemann/. Also in Ewald, William B., ed., 1996 “From Kant to Hilbert: A Source Book in the Foundations of Mathematics”, 2 vols. Oxford Uni. Press: 652–61. ^ Dudenredaktion; Kleiner, Stefan; Knöbl, Ralf (2015) [First published 1962]. Das Aussprachewörterbuch [The Pronunciation Dictionary] (in German) (7th ed.). Berlin: Dudenverlag. pp. 229, 381, 398, 735. ISBN 978-3-411-04067-4. ^ Krech, Eva-Maria; Stock, Eberhard; Hirschfeld, Ursula; Anders, Lutz Christian (2009). Deutsches Aussprachewörterbuch [German Pronunciation Dictionary] (in German). Berlin: Walter de Gruyter. pp. 366, 520, 536, 875. ISBN 978-3-11-018202-6. ^ Mccleary, John. Geometry from a Differentiable Viewpoint. Cambridge University Press. p. 282. ^ Sexton, M (7 December 2010). "Top 10 Greatest Mathematicians". Listverse. ^ Hawking, Stephen (2005). God Created the Integers. Boston: Running Press. pp. 814–815. ISBN 978-0-7624-1922-7. ^ a b Marcus du Sautoy, The Music of the Primes, HarperCollins: 2003. ^ "Christian Mathematician – Riemann". Retrieved 13 October 2014. 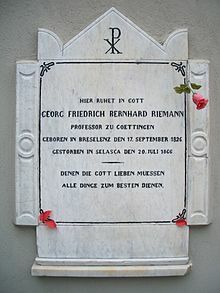 ^ "Riemann's Tomb". Retrieved 13 October 2014. ^ Arnold Sommerfeld, „Vorlesungen über theoretische Physik“, Bd.2 (Mechanik deformierbarer Medien), Harri Deutsch, S.124. Sommerfeld heard the story from Aachener Professor of Experimental Physics Adolf Wüllner. Derbyshire, John (2003), Prime Obsession: Bernhard Riemann and the Greatest Unsolved Problem in Mathematics, Washington, DC: John Henry Press, ISBN 0-309-08549-7 . Monastyrsky, Michael (1999), Riemann, Topology and Physics, Boston, MA: Birkhäuser, ISBN 0-8176-3789-3 . Wikimedia Commons has media related to Bernhard Riemann. O'Connor, John J.; Robertson, Edmund F., "Bernhard Riemann", MacTutor History of Mathematics archive, University of St Andrews . Weisstein, Eric Wolfgang (ed.). "Riemann, Bernhard (1826–1866)". ScienceWorld.